Song begins with loud, emphatic notes and ends in lower notes, with notes evenly spaced. Description: Sexes similar. 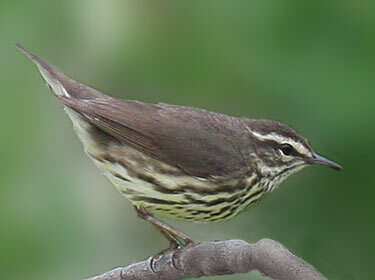 Olive brown above; uniformly colored underparts (Louisiana Waterthrush has contrast in color between flanks and rest of underparts); dark streaking on underparts; buffy eyebrow, of even width or slighly narrowing behind eye; has smaller bill and drabber leg color than Louisiana Waterthrush. Behavior: Walks rather than hops, and bobs its tail constantly and usually rapidly. 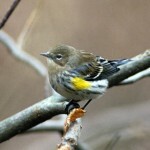 Habitat: Deciduous forests or woodlands near streams. Often forages near or on the ground. 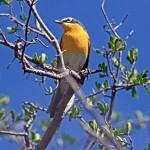 Where in Nebraska: Uncommon spring and fall migrant across the state, becoming rarer westwardly. 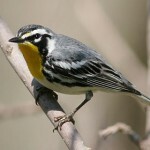 Fun Facts: Out of over 18,000 Northern Waterthrush banded 1955-1997, only 7 have been received; a 0.037% return.